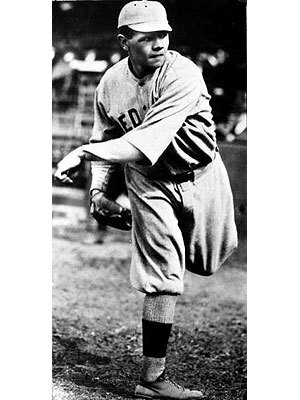 Ruth appeared in five games for the Red Sox in 1914, pitching in four of them. He picked up the victory in his major league debut on July 11. The Red Sox had many star players in 1914, so Ruth was soon optioned to the minor league Providence Grays of Providence, Rhode Island for most of the remaining season. Behind Ruth and Carl Mays, the Grays won the International League pennant. Shortly after the season, in which he'd finished with a 2-1 record, Ruth proposed to Helen Woodford, a waitress whom he had met in Boston. George Herman Ruth, a 19-year-old Baltimore schoolboy, was signed before the 1914 season by Jack Dunn, manager of the minor league Baltimore Orioles. Teammates called him “Jack’s newest Babe,” and the nickname stuck. In July, Dunn sold the “Babe” to the Boston Red Sox of the American League. Ruth arrived in Boston on the morning of July 11, 1914, and that afternoon was the starting pitcher against the Cleveland Naps. Ruth was lifted in the bottom of the inning for pinch hitter Duffy Lewis, who reached base and scored the go-ahead run. Boston went on to win 4-3, with Ruth picking up the win. His next start wouldn’t go so well, as he was knocked out in the fourth inning. He wouldn’t pitch again for more than a month, and his teammates grew to dislike his “crude manner, wild eating habits, and … carefree playing style that hard-nosed veterans viewed as lackadaisical,” writes HowStuffWorks. On Aug. 18, he was sent down to Providence, where he starred on the mound and in the batter’s box in leading the Grays to the International League pennant. He was recalled to Boston, where he received one more start, defeating the New York Yankees on Oct. 2. The date was July 11, 1914. A very young southpaw named George Herman Ruth made his major league debut for the Boston Red Sox. He was the victor in a 4-3 nipping of the lowly Cleveland Naps. That was how the Babe began as a pitcher and he just kept getting better. Born George Herman Ruth on February 6, 1895 in Baltimore, legend claims he was an orphan; the truth is his mother died when he was 16, his father when he was in the major leagues. His parents had placed him in St. Mary's Industrial School for Boys for his "incorrigible" behavior: stealing, truancy, chewing tobacco and drinking whiskey. Ruth's entire youth was spent at St. Mary's where his awesome baseball talent was developed. In 1914, he began his storied major league career with Boston where he won 89 games over six seasons before his sale to the Yankees for $125,000 in 1920. His 54 home runs that year were more than any other team total except the Phillies. His .847 slugging percentage stood as the all-time best until Barry Bonds and 2001 came along. "No one hit home runs the way Babe did," his teammate Lefty Gomez said. "They were something special. They were like homing pigeons. The ball would leave the bat, pause briefly, suddenly gain its bearings, then take off for the stands." " I've seen them," Waite Hoyt, his friend and Yankee teammate said, "kids, men, women, worshippers all, hoping to get his name on a torn, dirty piece of paper, or hoping for a grunt of recognition when they said, 'Hi-ya, Babe.' He never let them down; not once. He was the greatest crowd pleaser of them all."